For over two years my wife and I have been talking and dreaming of naming a church "All of Life." After we began to talk about it, we began to notice the phrase popping up all around us. It's always fresh and encouraging when we see it. So, we want you to see it...if you're into that sort of thing? The coming issue of Tabletalk magazine is titled "Doctrine for All of Life." The Spirit at Work #01 - "Gordon"
As we were trying to discern where we would plant our new church, my pastor, a friend, and myself spent an afternoon driving around Liberty Lake, Greenacres, Stateline, and Post Falls, Idaho. I relayed to them how I've been dreaming of bringing the light of the gospel to those who don't necessarily look, act, or talk like who we picture as "churchy folk." People with addictions, criminal records, tattoos, sailor-mouths, and other similar "undesirable" traits. My own story includes ten solid years of drug use, drug dealing, little run-ins with the law, etc. I believe I have this history for a reason, one that God will use in the lives of others. We cruised around the area talking and praying, then grabbed some lunch and returned to a parking lot where my car was parked. Before parting ways we prayed together, asking the Lord to show us the way. I specifically remember Ryan asking God to "give Jared a solid sign, a conversation, a letter in the mail, or anything He saw fit to confirm where he was leading us..."
It was July 30th and pretty hot outside so I jumped in my car and drove to a gas station that was about two minutes away to grab a cold drink. As I drove into the parking lot I saw a guy in his 20's with his shirt off and covered in tattoos walking up to the gas station. I got out of my car and walked toward the entrance. He was to the building's door while I was still about thirty feet away and just held it open for me. I thought it was an unusual gesture from one dude to another and really kind. I thanked him as we both walked inside to the drink coolers. I paid for my drink and as I was leaving the store I could feel the Lord just pressing on me and saying, "talk to this guy." I didn't really know what to say so I got in my car and started to pull out of the parking lot as he took a seat on a bench in the front of the store. The Lord created more tension in me in that moment, pressing and reiterating what I first heard from Him..."engage him!" Finally, I turned around and pulled up alongside him, rolling my passenger window down. "You need a ride, bro?" He replied that he was all good and was just waiting for his mom to come and pick him up. As he was talking I noticed he had the word "blessed" tattood on his neck in script. That was my inroad for some deeper conversation. "Are you blessed?" He replied that he was so I asked him who had blessed him. He said that "Jesus and God" had blessed him and then he began to tell me his story. His name was Gordon and he was just out of rehab for heroin addiction. He was sleeping at his grandpa's house but was stressed out because his grandpa didn't want him there. His mom was also living there and would sneak Gordon into her room to sleep on the floor. Then he'd sneak out before his grandpa woke up. I assume he broke trust with grandpa while he was a junkie. He told me he was looking for a job and had began drinking again a few days earlier. Just then I took note of the drink he bought in the store. It was sitting on the bench in a brown paper bag. I asked him what was in it and his eyes fell. Clearly he was ashamed. We all know what the brown paper sack means. It's the universal symbol for "everybody knows what I'm trying to hide in the bag." Instinctually, I grabbed my drink and handed it to him out the window while asking him to give me his beer. He played it off and said no but then after a short back and forth, I got pretty stern with him and said, "take my drink and give me your beer!" He handed it over. I encouraged him to follow Jesus closely and refuse to give in to the drugs or the alcohol. We talked briefly about a few other things and I told him I'd be praying for him. Then I drove away wishing him the best. I've been praying for him ever since. Not every day, but often. 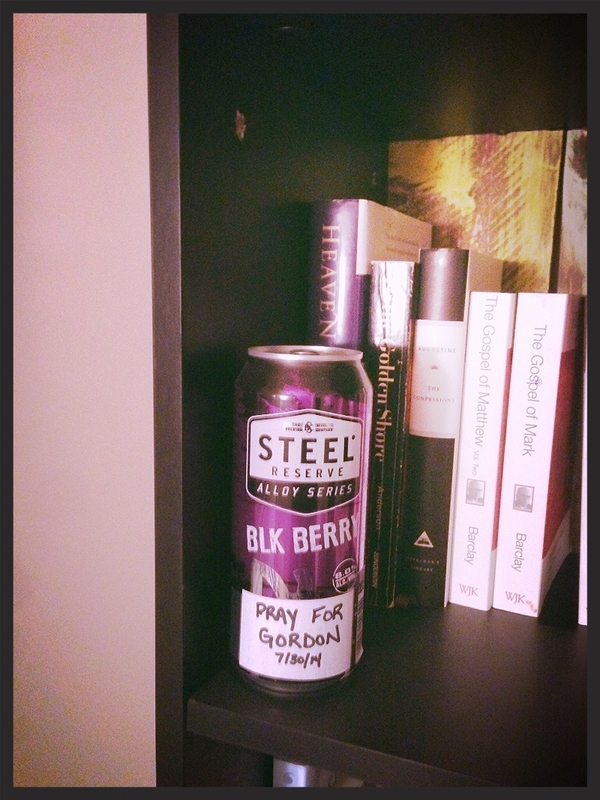 I still have his can of nasty beer on my bookshelf with a note on it to pray for him. My hope is that Gordon is walking with Jesus and someday, in eternity or before, he and I both will get to celebrate our conversation in the gas station parking lot. Perhaps the Spirit used me to help Gordon stay off the substances and close to Jesus? The Holy Spirit certainly used Gordon that day to confirm in my heart just who He is calling us to serve...less than ten minutes after Ryan prayed! Incredible. May Jesus be known and loved in this city. 6 Values That Drive AOL Church. Six things that drive All of Life Church.